Kansas City leaders on Wednesday advanced plans for a mixed-use $55 million development at the Uptown Shoppes at 36th Street and Broadway Boulevard. KANSAS CITY, Mo. 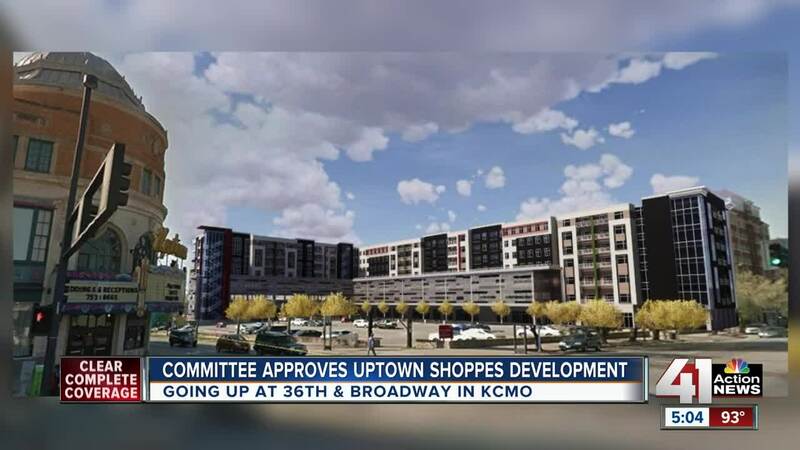 -- Kansas City leaders on Wednesday advanced plans for a mixed-use $55 million development at the Uptown Shoppes at 36th Street and Broadway Boulevard. Renderings provided by the developer, Sunflower Development Group, include 223 apartments units, 50,000 square feet of retail and approximately 789 parking spaces, including 380 spaces for the Uptown Theater, which currently has 320. "Knowing the Uptown pretty well, it's a site that we've always looked at as a great redevelopment site that we think will be transformational for that area," said Banks Floodman, director of business development of Sunflower Development Group. Floodman said he wants this project to fit in with the neighborhood. He met with community members and knew parking was a top priority. "We didn't want cars parked in the neighborhood," Floodman said. Councilwoman Katheryn Shields said the additional parking will help keep the Uptown Theater alive. "The great thing about this redevelopment is it understands the significance of the Uptown Theater and we're not jeopardizing the future of the Uptown Theater to have a new redevelopment," Shields said. The Kansas City Council’s finance committee approved the plans and the master financing agreement for the project. The financing plan contains tax breaks for the developer, including granting a sales-tax exemption for construction materials and giving the property owner 10 years without having to pay property taxes, followed by 15 years of paying 50 percent of the property taxes. "Given the scale and the size of it, frankly it just doesn't work without those necessary incentives, investments," Floodman said. The full council will consider the plans on Thursday. Uptown Theater owner Larry Sells told 41 Action News that developers could break ground on the project as soon as March 2019.